Today On The Run #12 – 365 Days! 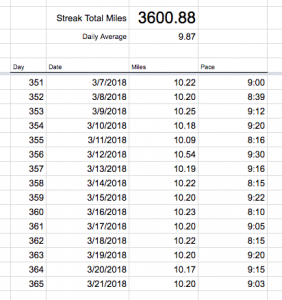 On Wednesday, March 21, I marked the completion of 1 year of running every day. No days off. 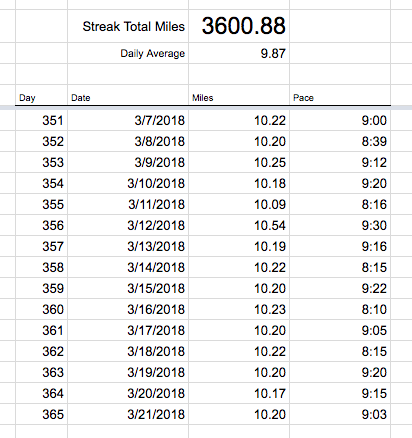 Yes, those numbers are accurate; all runs are cataloged in my Garmin Connect profile. Even I know how much I run, 3600 miles in aggregate form still wows me! I don’t know just how I pulled it off. There were definitely days where I just didn’t feel like running or time just didn’t seem to be available to squeeze it in. But, after getting past all the excuses, I had pretty much no regrets about any single run. Around 547 hours on the road. Thankfully, my current locale makes most running pretty easy for about 3/4 of the year. The only real trouble spots are the dead of summer and winter. I’m not a big fan of hot, but most of the time I run outside of the hottest parts of the day. The cold, where nowhere as bad as it was back in New York, is more annoying than problematic, except for a few days. We had a nice little teaser of spring a few weeks ago. Temperatures were in the high 50s at 4am. Then the cold came back; low 30s are pretty annoying. Then, it got a little warmer, but the rains came. So, far I’ve been able to time it so I’ve only gotten light to moderate rain during my runs. The current short term forecast is looking pretty good, warmer and dry. Looking forward to it! Are you planning to stop the streak or cut back on mileage? No and no. Everything feels pretty good at the moment, so I’m just gonna keep rolling with it. Are you gonna do any races? Still a question mark at this point. Even though I’ve got all these miles, I’m not really doing speedwork or dedicated hill work. Kinda getting the racing itch though.